Comments? 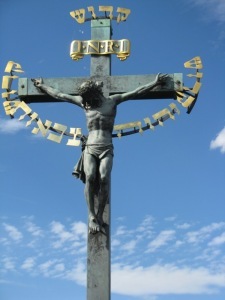 Click here for discussion. Right click and save target as here to download csv file with "FLT DECK DOOR" parameter. Secondly, On January 23rd of a rapidly dissipating 2009, Barack Obama perpetrated his first war crime (as president) by authorizing a drone attack in Pakistan. In February of this same year, he ordered an increase of roughly 20,000 more troops to Afghanistan: more war crimes, no corresponding outcry. However, when I cried out, I was roundly attacked by the “left” for not giving Obama a “chance.” 2009 is going to be the most deadly year for our troops and Afghan and Pakistani civilians on record. I think George Bush is calling: he wants his Nobel Peace Prize back. It is being widely reported (and it seems hotly anticipated by some)—that even though the “anti-war” movement wrote a letter to Obama and asked him to “pretty please” not send any more troops to Afghanistan and had us calling the White House all day on Monday the 23rd when Obama was scheduled to hold his final “war summit"—that the U.S. will commit 34,000 more troops to Afghanistan which is a 50 percent increase in troop strength in the Land of Certain Empire Death. True story: in October of 2005, U.S. troop deaths were going to reach 2000, within days and the “movement” was planning its response. I called for a die-in, with risk of arrest, in front of the White House and MoveOn.org called for a candlelight vigil in Lafayette Park. MoveOn.org moved their vigil to another location because they told me that their members weren't ready to do civil disobedience and some of them may be accidentally swept up in some kind of a "peace sweep." I said, “Fine, MoveOn.org, have a candlelight vigil for 2000 like you did for 1000 and next year you'll have one for 3000, then 4000, and then 5000.” I think many of MoveOn.org's members were ready, I just don't think that MoveOn.org was then, or is now. They didn't do it when Bush was president, I can't imagine MoveOn.org standing up for peace when their man is the one doing the killing. “How come Barak, Israel’s Defence Minister, is under threat of being arrested in the UK while Khaled Mashaal, the leader of Hamas, roams London free of concern” asks Prof Alan Dershowitz, who is probably the leading defender of the Jewish state in America. In fact the question could be easily extended, one may wonder how come Dershowitz and his ilk are roaming freely between Western capitals considering the racist, nationalist expansionist ideology they promote i.e. Zionism. At the end of the day, Dershowitz the loudest Zionist apologist in America is promoting a precept that has proved to be genocidal. What intrigues me about Dershowitz is the fact that Israel’s leading Hasbara cheer-leader is also one of America’s most prominent criminal lawyers specialising in murder and attempted murder cases. As a criminal appellate lawyer, Dershowitz has won thirteen out of the fifteen murder and attempted murder cases he has handled. Notable is his role as the appellate adviser for the defence in the criminal trial of O.J. Simpson. Seemingly, this is exactly what Israel needs and deserves, a ‘criminal attorney’. One that would help it to get away with murder. In a conversation with Ynet, a leading Israeli paper, Dershowitz claimed that Judge Richard Goldstone, the author of the UN report investigating Operation Cast Lead, “preferred to give interviews to public television rather than debating him.” Dershowitz said that it isn't appropriate for Goldstone to ‘filter whom he debates with’. One may wonder why? It is a common and accepted practice amongst humanists not to share a platform with racists. Zionism is not only a racist ideology, it is also murderous in practice. Dershowitz is a proud rabid Zionist. It is understandable that any decent human being would prefer to avoid sharing a platform with him or his cohorts. According to Ynet, “Dershowitz demanded that Judge Goldstone provide explanations of the sources that led him to his final conclusion in the report, which asserted that Israel's policy in Operation Cast Lead was to kill as many Palestinian civilians as possible.” Dershowitz, may have to find time to watch this Youtube video. It is all there. An extensive review of the Israeli terror campaign in Gaza. One doesn’t have to be a military expert to grasp that pouring WMD, and using artillery against a civilian population is sufficient evidence. Israeli murderous tactics are now established facts and common knowledge. Dershowitz said that he “does not expect Israel to suffer much damage in the US following the Goldstone report. He asserted that the Americans understand that the Human Rights Council is a farce and its conclusions not taken too seriously”. Dershowitz obviously fails to tell the truth. If the Human Rights Council is a ‘farce’ as he says, why does Zionist loud mouth Dershowitz insist to debate Judge Goldstone? Dershowitz also claimed that “Israel can breathe easily in academic circles as well, saying that students in the US can think for themselves and will not believe that Israel decided intentionally to kill Palestinian civilians.” Again, if this is the case, if Israel’s reputation within the academic circuit is secured, why is Dershowitz & Co mounted pressure on Finkelstein, Walt, Mearsheimer and every other critical voice of Israel and Zionism. Dershowitz is obviously failing to tell the truth again. He can see that the tide is changing. He knows that every ethically orientated human being sees the truth behind Israeli brutality. Why is Dershovitz lying? Because Jewish nationalism left, right and centre is grounded on a set of lies. By way of deception they make their wars. Colvin’s comments come at a sensitive time for the minority government, which was almost ousted by the opposition a year ago. So far 133 Canadian soldiers have died in Afghanistan and recent polls indicate most Canadians oppose the mission. Colvin said Canadian military leaders in Afghanistan “cloaked our detainee practices in extreme secrecy,” refused to hand over details of prisoners to the Red Cross in a timely fashion and kept “hopeless” records. “As I learned more about our detainee practices, I came to the conclusion that they were un-Canadian, counterproductive, and probably illegal.” Officials in Ottawa initially ignored his reports. “By April 2007 we were receiving written messages from the senior Canadian government coordinator for Afghanistan to the effect that we should be quiet and do what we were told,” he said. Canadian troops first began transferring detainees to Afghan authorities in late 2005. Eventually, faced with persistent allegations of abuse, Ottawa signed a deal with Kabul in May 2007 to boost protection for detainees. Colvin said Canadian troops regularly detain six times as many Afghans as the British, who are also operating in southern Afghanistan. Although some may have been Taliban members, many were “random human beings in the wrong place at the wrong time”. He added: “We detained and handed over for severe torture a lot of innocent people. Complicity in torture is a war crime.” In the face of accusations of this complicity, Prime Minister Stephen Harper publically insisted Canadian military officials did not send individuals off to be tortured. “Behind the military’s wall of secrecy that unfortunately was exactly what we were doing,” Colvin told his captive audience. Now, instead of launching an inquiry, the Conservatives are pursuing their usual practice of smearing critics. “We frankly just found his evidence lacked credibility. All his information was, he admits, at best second hand,” said Lawrie Hawn, parliamentary secretary to Defense Minister Peter MacKay. MacKay angrily dismissed the charges, while former Canadian military chief-in-command in Afghanistan Rick Hillier can’t “remember reading a single one of those cables”, and depicted the fuss as mere “howling at the moon”. “Even in our own prisons somebody can get beaten up,” he cracked to reporters. But then this is standard operating procedure for Harper’s Conservatives. They called New Democratic Party leader Jack Layton “Taliban Jack” for his suggestion that NATO should negotiate with elements of the Taliban. That is now the policy not only of Canada in Afghanistan, but of the Karzai government in Kabul. In The Unexpected War, Janice Gross Stein and Eugene Lang report that the Afghan Independent Human Rights Commission, Amnesty International, and Canadian Louise Arbour, the UN Commissioner for Human Rights “had concluded that abuse, torture, and extrajudicial killing were routinely inflicted on people in Afghan custody.” University of Ottawa Law Professor Amir Attaran documented how Afghan detainees have been beaten not only by the NDS, but while detained and interrogated by Canadian soldiers. Attaran called for an investigation into the treatment of the detainees by the Military Police Complaints Commission, a civilian body established to investigate complaints against the Canadian military. In February 2007, the Canadian military launched an investigation and heard testimony concerning three Afghans beaten by Canadian soldiers, handed over to the Afghans, who subsequently disappeared. The Globe and Mail managed to interview thirty former detainees who said they had been transferred from Canadian to Afghan jurisdiction and then had been tortured. Colvin immediately warned that the new agreement was full of holes. It can only be concluded that the government condoned the torture, ignoring and now pooh-poohing complaints about it. Attempts to feign innocence don’t hold water. According to a senior NATO official, Harper used a “6,000-mile screwdriver” to make sure “that every single statement that went out [was] cleared by him personally”. Michael Semple, Colvin’s EU colleague in Kabul, said he was “totally flabbergasted” by insinuations that Colvin’s reports were not credible, that he was a closet Taliban sympathiser “soft on terrorists”. Colvin was an “absolutely rock solid” diplomat who volunteered to go in as a civilian representative with Canada’s Provincial Reconstruction Team in Kandahar after a close friend of Semple’s was killed by a suicide car bomber outside Kandahar. But to anyone who knows anything at all about US -- and now, alas, Canadian -- politics this is hardly new. Colin Powell’s rise to the heights of US politics was due to his burying the initial reports of the My Lai massacre in 1968 where US troops gunned down 500 mostly women, children and seniors in an act of revenge. Charged with investigating the incident, then major Powell reported, “In direct refutation of this portrayal is the fact that relations between American soldiers and the Vietnamese people are excellent.” Powell was promoted to lieutenant-colonel in 1970, served a White House fellowship under president Richard Nixon from 1972-73, and continued up the ladder, becoming a general in 1989 and finally secretary of state in 2001. Current Canadian politics occasionally provides a touch of humour to the inanities of Western moral hypocrisy. Remember the travel ban imposed by the Conservative government on UK MP George Galloway this spring, apparently because he is a terrorist. The Conservative government denied it had anything to do with the decision, that it was entirely up to the Canada Border Services Agency. Or the current furore over US lesbian soldier Bethany Lanae Smith, whom a Canadian judge insists be granted refugee status, overturning an Immigration and Refugee Board ruling. Not because she rejects the illegal US wars and occupations, but because she was harassed by male US soldiers and resented their taunts and/or untoward advances. No Way Through: what if the Zionists ruled your country? Thanks to Z for the translation and to A for additing the subtitles to the video. The last couple of minutes of the speech are missing due to a station break. Whilst the US threatens Iran with consequences, Russia rules out the possibility of additional UN Security Council sanctions against Tehran at the present juncture. Russian Foreign Ministry Spokesman, Andrei Nesterenko, said on Thursday that there was as yet no talk of new sanctions at the UN Security Council. "Currently there is no discussion about working out additional sanction measures against Iran at the UN Security Council," he said in a statement. "At the current moment it is important to let diplomacy work, and superfluous emotions only harm the situation," he added. Note: in the meanwhile, the "big guys" (P5+Germany) are meeting in Brussels behind closed doors to discuss Iran. 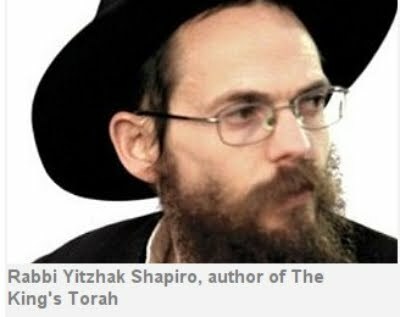 The following is a review of Torat ha-Melekh, a “kind of guide for anyone who ponders the question of if and when it is permissible to take the life of a non-Jew”. It was published by Ma’ariv Israel's second biggest paper. It is a must read. I would assume that those American and British corrupted politicians who are happy to take donations from Israeli Tycoons and other ‘Friends of Israel’ better start to understand once and for all what kind of Ideology they are aligning themselves with. After Israel released photos it said proved that a huge shipment of weapons for Hezbollah came from Tehran, Iranian news agencies publish evidence showing that the photos are forged. Israeli naval sources recently claimed that they found a large cache of Iranian-made arms when they stormed a vessel near Cyprus in the Mediterranean Sea. They claimed that the ship was heading for the Hezbollah resistance movement, either in Lebanon or Syria. Iran instantly dismissed the claims, issuing a statement with which it condemned Israel's many acts of piracy in international waters. But the Israeli government persisted in its accusations, releasing what it claimed to be photos and documents in an effort to implicate the Iranian government in the matter. The photos and documents were carried by a number of leading newspapers in the West, including The Los Angeles Times. "The Israeli regime has made a fool of itself with regards to what it claims to be evidence that Iran was sending weapons to Hezbollah," IRNA news agency said on Monday. 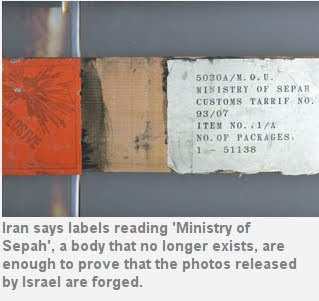 "Take a close look at the photos, one of which merely shows a couple of boxes labeled 'Ministry of Sepah' without providing corroborative evidence that they came from Iran, and you will see the huge gaffe committed by Israel," it added. The article explained that Iran's Ministry of Sepah gave its place to the Defense Ministry more than twenty years ago. "So this begs the question of what the emblem of a nonexistent body was doing on the cargo?" "It seems the American daily has failed to get its facts straight, or on the other hand, maybe it is getting its cue from the Israeli leadership," said the news agency. "In any case, the newspaper should know that if a country plans to send a secret arms cargo to another, it will not brand the shipment with a full description of the batch." "Tel Aviv's baseless claims [about Iran providing Hezbollah with military] are evidently designed to justify another Israeli attack on Lebanon." Yadollah Javani, the Director of the Political Bureau of the Islamic Revolution Guards Corps (IRGC), said last week that the claims were intended to divert attention from a UN report detailing Israeli war crimes in Gaza. "These accusations are nothing but an Israeli ruse to deflect international attention from the Goldstone report as they move closer to the war crimes tribunal [at the International Criminal Court (ICC)]," noted Brigadier General Javani. He was referring to the 575-page report headed by Jewish South African judge Richard Goldstone, which detailed numerous acts of war crimes and human rights violations committed by Israeli soldiers during their incursion into Gaza. "Israeli officials have a longstanding tendency to level baseless accusations against others when they are in serious trouble," he added. Lebanese Parliament Speaker Nabih Berri also dismissed the charges, questioning why the Israelis had failed to detain the crew, if the ship was supposedly carrying weapons. Berri said that while Hezbollah has the right to obtain arms from “anywhere in the world,” it is pretty obvious that Israel made the claims to fudge the issue of its war crimes in Gaza. Why is Saudi Arabia going on a weapons shopping spree in Russia? Russian media outlets are reporting that Saudi Arabia is negotiating a 2 billion dollars weapons deal with Russia which would include the sale of 150 helicopters (30 Mi-35 and 120 Mi-17), over 150 T-90C tanks, about 250 BMP-3 (infantry combat vehicle) armored vehicles and several dozens of anti-aircraft systems and complexes including the brand new S-400 Triumf missile system. 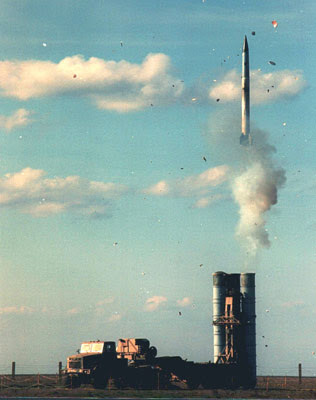 In the meantime, Russia is also clearly delaying the sale of its S-300 missile system to Iran prompting some angry remarks from Iranian Chief of Staff of Iran's Joint Armed Forces Hassan Firouzabad. Is this all a coincidence? One needs to remember here that Saudi Arabia has often served as the USraelian Empire's banker, providing money in support of US strategic objectives (the best examples of this are the war in Afghanistan and the US support for the Nicaraguan "Contras"). Why would Saudi Arabia, which has always relied almost exclusively on US made weapons systems, suddenly turn to Russia? Most definitely not because Russian weapons systems are better - which they undoubtedly are, by the way - as weapons purchases are almost never decided on the basis of technical capabilities. Three factors decide in such deals: the kickbacks given to the officials involved in the deal, the political pressures and allegiances of the countries involved and the offset agreements provided as an incentive by the parties (including, of course, even more kickbacks). In this case, the US is as least as corrupt as Russia and can easily match any kickbacks, the political allegiances of the Saudis are clearly with the USA, and there is no way that Russia could offer better offset terms than the USA. Hence - the Saudi shopping spree, if confirmed and finalized, is definitely a reward for Russia's reneging on the S-300 deal with Iran. The Iranian military Chief of Staff Hassan Firouzabad is, of course, quite correct when he asks the key question: "Don't Russian strategists realize Iran's geopolitical importance to their security?". While I am quite confident that Russian strategists understand this perfectly well, I am also inclined to believe that these strategists do not have the final say in Russian policy making. Call it the almighty Dollar, or Ruble, or Riyal - the bottom line is that the Russian government appears to favor short-term economic interests over long-term national security objectives. If that is true, that is very bad news indeed. Today Limbert is the newly appointed Deputy Assistant Secretary for Iran in the State Department's Bureau of Near Eastern Affairs. That makes him Secretary of State Hillary Clinton's point person on Iran, just as pressure is building in Congress to impose more sanctions on the Islamic Republic. Before he became a reluctant long-term guest at the U.S. Embassy, Limbert served as a Peace Corps volunteer and then English teacher in Iran, during the tyrannical reign of the last Shah. His later diplomatic career led him to tours in Algeria, Guinea, Djibouti, Saudi Arabia and the United Arab Emirates. In 2003, as ambassador to Mauritania, he was among the first U.S. diplomats to enter Baghdad after the U.S. invasion, charged with helping to protect Iraq's cultural treasures from looters. He later returned to support the U.S. occupation. Some progressives are noting that, until his most recent appointment, Limbert served on the board of advisors of the National Iranian American Council, an anti-sanctions organization. However, NIAC receives funding from both George Soros' Open Society Institute, which previously supported the so-called “color” revolutions in Georgia and the Ukraine, and the National Endowment for Democracy, formed to continue the CIA program of regime change of governments deemed not sufficiently respectful of Western interests. Both Soros and the NED have been supporting the “Green Movement” in Iran, which on the one hand promotes an opening of the domestic political process, and on the other an economic program of privatization, deregulation and broad cutbacks in government-funded social services for the poor, plus a foreign policy that would seek to avoid pressure from the West by reducing support for the Palestinian struggle and cooling ties with leftist governments in Latin America. Neither did he expect, most likely, to become a key State Department official dealing with the government of his former captors. But while his preferred methods may differ from those of Dennis Ross, it would be naive to think that his political goals are any less ambitious: undermining Iran's growing ability to oppose U.S. policy in the Middle East by restricting its access to alternative energy sources while promoting a change to a government friendlier to Western corporate interests. PHIL WILAYTO is an anti-war activist based in Richmond, Va., and the author of “In Defense of Iran: Notes from a U.S. Peace Delegation's Journey through the Islamic Republic.” He can be reached at: DefendersFJE@hotmail.com. The possibility of an imperialist war in the Americas came a step closer on October 30, when Colombia and the United States finalized a ten year accord allowing the U.S. to massively expand its military presence in the Latin American nation. The move comes as the U.S. seeks to regain its hegemony over Latin America – which has declined over the past decade in the context of a continent-wide rebellion against neoliberalism spearheaded by the Bolivarian Revolution in Venezuela, led by President Hugo Chavez. In order to regain control of its “backyard,” the U.S. is increasingly resorting to more interventionist measures. This is reflected by the recent military coup in Honduras, destabilisation of progressive governments in Bolivia, Venezuela, Ecuador and Paraguay and a massive military build up in the region, including new military bases in Panama and the reactivation of its Fourth Fleet. Over the past decade the Venezuelan government, which is the fifth largest oil exporter in the world, has used its control over this resource to massively increase social spending. This has resulted in significant achievements, such as poverty levels being reduced by half, the eradication of illiteracy, and free universal education and healthcare for the poor. In 2005 Chavez declared the revolution to be outright socialist in its aims. Since then, in addition to regular elections and referendums, the government has sought to promote grassroots democracy and participation, through the creation of institutions such as urban land committees, health committees, grassroots assemblies, communes, workers’ councils and communal councils. However, these pro-poor and redistributive policies have increasingly brought the Chavez government into conflict with powerful economic interests both in Venezuela and the U.S. The new bases deal poses a direct threat to this radical process of social change. Hand in hand with this military build up has come a fraudulent propaganda campaign that tries to paint the democratically elected Chavez government as a “dictatorship” and claims that the government promotes drug trafficking, and supplies arms to left-wing guerrillas in Colombia. Tensions between Venezuela and the U.S.-aligned government of Colombian President Alvaro Uribe have also increased with the deal. As the negotiations came to light in July, Chavez ordered the “freezing” of all diplomatic and commercial relations with Colombia. With the finalization of the accord Chavez declared that Colombia had handed over it’s sovereignty to the U.S. “Colombia today is no longer a sovereign country... it is a kind of colony,” he said. Under the deal, the U.S. military has access, use, and free movement among two air bases, two naval bases, and three army bases, in addition to an existing two military bases, as well as all international civilian airports across the country. The deal also grants U.S. personnel full diplomatic immunity for any human rights abuses or other crimes committed on Colombian soil. Among other things, U.S. military, civilian, and diplomatic personnel and contractors covered by the accord are also exempt from customs duties, tariffs, rent and taxes, while ships and planes are exempt from most cargo inspections. Although U.S. officials claim publicly that only 800 personnel will operate in Colombia the deal places no limits on the numbers of military personnel that can be deployed. U.S. President Barack Obama and Secretary of State Hillary Clinton have repeatedly denied that under the accord Colombia will be used as a launching pad for military interventions in other South American countries. However, as James Suggett pointed out in a recent Venezuelanalysis.com article, the U.S. military’s financial documents tell a different story. “The Pentagon budget for the year 2010 says the Department of Defense seeks ‘an array of access arrangements for contingency operations, logistics, and training in Central/South America,’ and cites a $46 million investment in the “development” of Colombia’s Palanquero air base as a key part of this,” Suggett wrote. “A presence [at the Palanquero base] will also increase our capability to conduct Intelligence, Surveillance and Reconnaissance (ISR), improve global reach, support logistics requirements, improve partnerships, improve theater security cooperation, and expand expeditionary warfare capability,” the budget states. “It also supports mobility missions by providing access to the entire continent, except the Cape Horn region, if fuel is available, and over half of the continent if unrefueled,” the budget continues. Colombian paramilitaries operating illegally in Venezuela’s oil rich border regions, together with the right-wing opposition in Venezuela are the advance guard of this imperialist project to destabilise and ultimately defeat the Bolivarian revolution. In addition, Venezuela announced that it has captured three Colombians accused of spying for Colombia’s intelligence service, the Administrative Security Department (DAS), as well as documents that indicate that Colombia sent spies to Venezuela, Ecuador and Cuba as part of a CIA operation. Then on November 2, two Venezuelan National Guard members were shot dead at a border checkpoint by armed gunmen. In response the Venezuelan army has begun massive security sweeps of the border region where paramilitary groups, Colombian guerrillas, extortion and kidnapping rings and smugglers are rife. Also, trade between the two countries dropped a dramatic 49.5% for September, after Chavez ordered commercial relations to be “reduced to zero” to protest the bases. Brazil, the major economy in South America has called for “dialogue” between Chavez and Uribe. While an armed conflict is a possibility, the current tactic of the U.S. is to continue undermining and destabilising the Venezuelan revolution in the hope that it will collapse under its own weight. A war would also be dangerous for U.S. imperialism already bogged down in Iraq, Afghanistan and Pakistan. Even a proxy war via Colombia would be likely to spiral out of control. Latin America’s poor, downtrodden and marginalized have had a taste of independence; it is likely they would fight back. Obama’s strategy is now described as focussed on securing the main cities in Afghanistan, while abandoning most of the country to the Taliban. This can only be a holding measure while attempts are made to lure moderate elements in the Taliban away from their comrades to join the Karzai clique. In talks with former Taliban foreign minister Mullah Wakil Ahmed Mutawakkil brokered by Saudi Arabia and Turkey, US negotiators supposedly offered governorship of six provinces in the south and northeast, a senior Afghan Foreign Ministry official told IslamOnline.net – if they accept the presence of NATO troops in Afghanistan and eight US bases. The grand jury subpoena also required the Philadelphia-based Indymedia.us Web site "not to disclose the existence of this request" unless authorized by the Justice Department, a gag order that presents an unusual quandary for any news organization. "I didn't think anything we were doing was worthy of any (federal) attention," Clair said in a telephone interview with CBSNews.com on Monday. After talking to other Indymedia volunteers, Clair ended up calling the Electronic Frontier Foundation in San Francisco, which represented her at no cost. Under long-standing Justice Department guidelines, subpoenas to members of the news media are supposed to receive special treatment. One portion of the guidelines, for instance, says that "no subpoena may be issued to any member of the news media" without "the express authorization of the attorney general" – that would be current attorney general Eric Holder – and subpoenas should be "directed at material information regarding a limited subject matter." Still unclear is what criminal investigation U.S. Attorney Morrison was pursuing. Last Friday, a spokeswoman initially promised a response, but Morrison sent e-mail on Monday evening saying: "We have no comment." The Justice Department in Washington, D.C. also declined to respond. Kevin Bankston, a senior staff attorney at the San Francisco-based Electronic Frontier Foundation, replied to the Justice Department on behalf of his client in a February 2009 letter (PDF) outlining what he described as a series of problems with the subpoena, including that it was not personally served, that a judge-issued court order would be required for the full logs, and that Indymedia did not store logs in the first place. Morrison replied in a one-sentence letter saying the subpoena had been withdrawn. Around the same time, according to the EFF, the group had a series of discussions with assistant U.S. attorneys in Morrison's office who threatened Clair with possible prosecution for obstruction of justice if she disclosed the existence of the already-withdrawn subpoena -- claiming it "may endanger someone's health" and would have a "human cost." Lucy Dalglish, the executive director of the Reporters Committee for Freedom of The Press, said a gag order to a news organization wouldn't stand up in court: "If you get a subpoena and you're a journalist, they can't gag you." Dalglish said that a subpoena being issued and withdrawn is not unprecedented. "I have seen any number of these things withdrawn when counsel for someone who is claiming a reporter's privilege says, 'Can you tell me the date you got approval from the attorney general's office'... I'm willing to chalk this up to bad lawyering on the part of the DOJ, or just not thinking." Making this investigation more mysterious is that Indymedia.us is an aggregation site, meaning articles that appear on it were published somewhere else first, and there's no hint about what sparked the criminal probe. Clair, the system administrator, says that no IP (Internet Protocol) addresses are recorded for Indymedia.us, and non-IP address logs are kept for a few weeks and then discarded. EFF's Bankston wrote a second letter to the government saying that, if it needed to muzzle Indymedia, it should apply for a gag order under the section of federal law that clearly permits such an order to be issued. Bankston's plan: To challenge that law on First Amendment grounds. But the Justice Department never replied. "This is the first time we've seen them try to get the IP address of everyone who visited a particular site," Bankston said. "That it was a news organization was an additional troubling fact that implicates First Amendment rights." This is not, however, the first time that the Feds have focused on Indymedia -- a Web site whose authors sometimes blur the line between journalism, advocacy, and on-the-streets activism. In 2004, the Justice Department sent a grand jury subpoena asking for information about who posted lists of Republican delegates while urging they be given an unwelcome reception at the party's convention in New York City that year. A Indymedia hosting service in Texas once received a subpoena asking for server logs in relation to an investigation of an attempted murder in Italy. Bankston has written a longer description of the exchange of letters with the Justice Department, which he hopes will raise awareness of how others should respond to similar legal demands for Web logs, customer records, and compulsory silence. "Our fear is that this kind of bogus gag order is much more common than one would hope, considering they're legally baseless," Bankston says. "We're telling this story in hopes that more providers will press back and go public when the government demands their silence." Update 1:59pm E.T. : A Justice Department official familiar with this subpoena just told me that the attorney general's office never saw it and that it had not been submitted to the department's headquarters in Washington, D.C. for review. If that's correct, it suggests that U.S. Attorney Tim Morrison and Assistant U.S. Attorney Doris Pryor did not follow department regulations requiring the "express authorization of the attorney general" for media subpoenas -- and it means that neither Attorney General Eric Holder nor Acting Attorney General Mark Filip were involved. I wouldn't be surprised to see an internal investigation by the Office of Professional Responsibility; my source would not confirm or deny that.